The Stop & Start system puts the engine temporarily into standby - STOP mode - during stops in the traffi c (red lights, traffi c jams, or other...). The engine restarts automatically - START mode - as soon as you want to move off. The restart takes place instantly, quickly and silently. Perfect for urban use, the Stop & Start system reduces fuel consumption and exhaust emissions as well as the noise level when stationary. - with the electronic gearbox system , at speeds below 4 mph (6 km/h), press the brake pedal or put the gear lever in position N .
If your vehicle is fitted with the system, a time counter calculates the sum of the periods in STOP mode during a journey. It rests itself to zero every time the ignition is switched on with the key. For your comfort, during parking maoeuvres, STOP mode is not available for a few seconds after coming out of reverse gear. Never refuel with the engine in STOP mode; you must switch off the ignition with the key. - some special conditions (battery charge, engine temperature, braking assistance, ambient temperature...) where the engine is needed to assure control of a system. In this case, the "ECO" warning lamp fl ashes for a few seconds then goes off. This operation is perfectly normal. - or engage reverse gear. - some special conditions (battery charge, engine temperature, braking assistance, ambient temperature...) where the engine is needed for control of a system. In this case the "ECO" warning lamp fl ashes for a few seconds, then goes off. 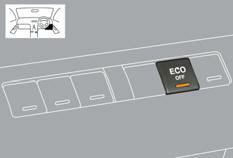 At any time, press the "ECO OFF" switch to deactivate the system. This is confirmed by the switch warning lamp coming on accompanied by a message in the screen. If the system has been deactivated in STOP mode, the engine restarts immediately. Press the "ECO OFF" switch again. The system is active again; this is confirmed by the switch warning lamp going off and a message in the screen. The system is reactivated automatically at every new start using the key. In the event of a fault with the system, the "ECO OFF" switch warning lamp fl ashes then comes on continuously. Have it checked by a PEUGEOT dealer or a qualified workshop. In the event of a fault in STOP mode, the vehicle may stall: all the instrument panel warning lamps come on. It is then necessary to switch off the ignition and start the engine again using the key. Before doing anything under the bonnet, deactivate the Stop & Start system to avoid any risk of injury resulting from automatic operation of START mode. This system requires a 12 V battery with a special specification and technology (reference numbers available from PEUGEOT dealers). Fitting a battery not listed by PEUGEOT introduces the risk of malfunction of the system. To charge the battery, use a 12 V charger and observe the polarity. The Stop & Start system makes use of advanced technology. For any work on the system go to a qualified workshop with the skills and equipment required, which a PEUGEOT dealer is able to provide.